We clean garden patios that have become infested with moss, algae (the green slimy slippery stuff) and dirt over time, we have all the latest patio and driveway cleaning equipment including high pressure rotary surface cleaners (some times referred to as patio cleaners) and high powered diesel pressure washers. These specialised cleaning items are produced solely for hard surface driveway and patio cleaning and maintenance and enable us to carry out out patio cleaning and refurbishment keeping striping and streaking caused by the conventional lance to a minimum. We operate a professional yet friendly service and always happy to give free advice and quotes, with full public liability insurance up to £1,00,000 for your piece of mind and can provide references and written quotes for your patio cleaning on request. 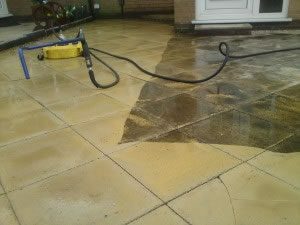 We are familiar with all types of patios and can provide different cleaning , methods for each variant including black spot (lichen) removal on the very prone Indian sand stone, York stone and other natural stone surfaces. 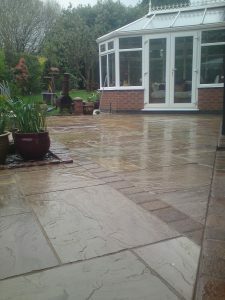 We don’t just provide patio cleaning and refurbishment, we provide a whole host of other services including patio sealing.